As said to the BelaPAN by the leader of the organizing committee of the Belarusian Party of Workers Aliaksandr Bukhvostau, on 15 December the Supreme Court of Belarus didn’t grant the lawsuit of the party concerning its’ non-registration by the Ministry of Justice. Belarusian human rights activist ales Bialiatski, vice-president of the International Federation for Human Rights, gives an outline of the situation of human rights defenders in Belarus during the recent years. On 6 May a co-chairman of the Belarusian Christian Democracy Party Pavel Seviarynets and the responsible secretary of the party Dzianis Sadouski had a meeting with the justice minister Viktar Halavanau concerning registration of the party. 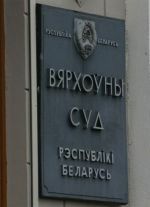 Front Line is concerned by the decision of the Supreme Court of the Republic of Belarus, on 22 April 2009, to maintain the previous decision of the Ministry of Justice not to register the human rights organisation Nasha Viasna (Our spring). Nasha Viasna is the new name of the human rights centre previously known as Viasna (Spring), which was closed down by the Supreme Court following the demand of the Ministry of Justice on 28 November 2003. The human rights center Viasna is one of the most active Belarusian human rights organisations, specialising in particular in the defence, protection and promotion of political and social rights. Shortly after the Nasha Viasna constituent congress on 29 March, the NGO’s Chair Ales Bialiatski commented on the underlying reasons for another attempt to obtain state registration. Today on 27 March the co-founders of the Nasha Viasna human rights organization received a letter from the Supreme Court of Belarus saying that the complaint against the unlawful refusal to register the NGO was received for consideration by the court. The session is due to start on 7 April.